We do not wear the same look every day, and actually, we wear totally different styles during the day according to the situation: we get dressed for work, we change when we go to the gym, or we get dressed up for an important cocktail or dinner. When we get back home, we get dressed to go to bed. 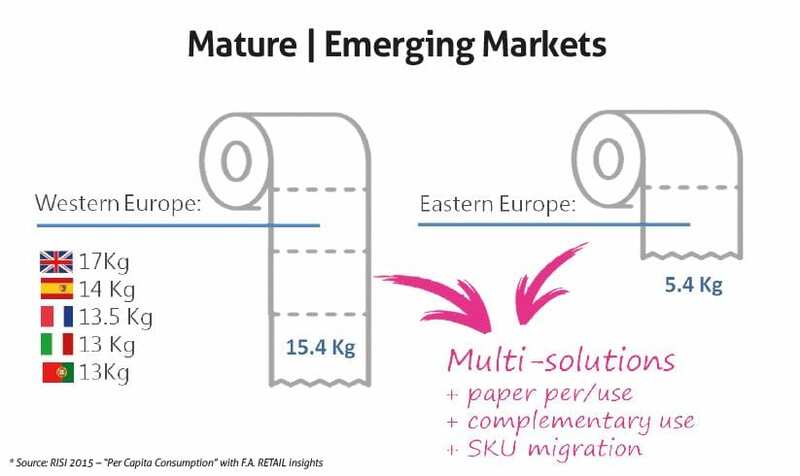 Although the tissue segment is not so glamorous (yet), shoppers are already purchasing according to what they want and their choices are based more and more on a variety of performance, quality and occasion – it is the perpetuation of multi-needs and the emerging of multi-shoppers. The reason why we see the tissue portfolio expanding is because we find specific niches in the market and each stock-keeping unit (SKU) is delivering a unique value for each particular target. It is an explosion of possibilities in a segment that was a commodity: colours, fragrances, lotions, decoration, textures, embossing, layers.. If we take a step back to understand how the market behaves, various megatrends support the long-term growth of global demands. However, the correlation between Population Growth and Economic Development is certainly one of the strongest. Our consumption is generally associated with “how much money we make” (Gross Development Product – GDP) and the total demand of a nation increases as the number of people consuming increases. Two big markets are established according to the correlation above described: Mature Markets and Emerging Markets. Even though there are cultural and economic variations across each one of these big markets, the per capita consumption level can be significant when comparing one with the other (according to Pirkko Petäjä, Pöyry Management Consulting). The industry is shifting from the North to the South and from the West to the East. Mature markets – in the West and in the North – will continue to grow but at a slowing rate. Because this market is reaching maturity in terms of per capita consumption, the interrelationship between GDP and tissue paper demand is becoming flat and predictable. In North America and Western Europe for example, the expected demand growth will be mainly driven by the population growth, and of course, addressing better products with higher values (ultra soft, 4+ ply, high absorption embossing). In the Emerging markets – specially represented by Latin America, Asia, Africa, East Europe – tissue consumption per capita is low and in the early stage of development. A large proportion of consumers are still below the income average and tissue products are having their penetration increased. The match-point for both markets, mature and emerging, is the importance of identifying the different needs among the shoppers and having special offers for each one. There are no more cost-benefit vs premium products; there are multi-solutions addressing specific expectations and usages. When comparing the consumption in Europe between mature and emerging markets, the average of consumption per capita in the Western Europe is about 15.5Kg, while in the East is three times less. And among the markets considered mature, we have strong differences between UK and Portugal, for example. Some categories are still not well penetrated, and the ones that already are, the general demand does not exceed 2 or 3 ply products and paper weigh (g/ m2) has very low standards. No matter what market we have, multishoppers require specific products and brands find different arguments to offer these multi-solutions: by offering products with more paper per use, by showing how their products can complement each other, and by promoting SKU migration (specially for emerging markets) – supporting the transition from very basic products to better quality ones. Companies and brands struggle to identify real solutions, to develop and manage a consistent portfolio in which every SKU plays an important role to address a different need. It is common to see companies working with a large number of items nowadays, focusing on different targets: big vs small packs; 1 ply vs many ply, tick embossing vs smooth, softness; resistance; absorption; white vs colours; virgin vs recycled. On the other hand, I see many companies distracting their targets by offering “mega soft versions” while also offering the “ultra mega soft versions”, which does not support the brand on achieving new targets or does not offer a clear consumption reason. From one side, we have the multishoppers pursuing complementary products and purchasing with a multichannel behaviour (offline and online). On the other side, brands are absorbing their behaviours to offer a consistent content template for their portfolio, identifying the most relevant content calendar for each subcategory in order to address customised promotions and campaigns. More important than having a large portfolio is how to identify what is really relevant, what adds value to a specific target and how to communicate the attributes of each product, helping the shopper during the purchase experience. The whole chain is about interpreting a need, translating it into a relevant content and finding a valuable way to communicate it. The category presents a low brand loyalty – which can be positive and negative, once shoppers migrate quite easily from one brand to another and from one version to a different one, just to try it. It is easy to convince them to change, especially if there is a price advantage. Because the shopping experience expected for tissue categories is also low, the easier we make it for the shopper, the more enjoyable it can be and probably less traumatic. Studies and retail experts state this category will be soon an “online category”, for two reasons: there is no need to be carrying bulky and big items back home if you can purchase online and get them easily delivered; and digital menus facilitates the process by organising the SKUs by “needs”, while product placement in a physical store can be very confusing and not encouraging. 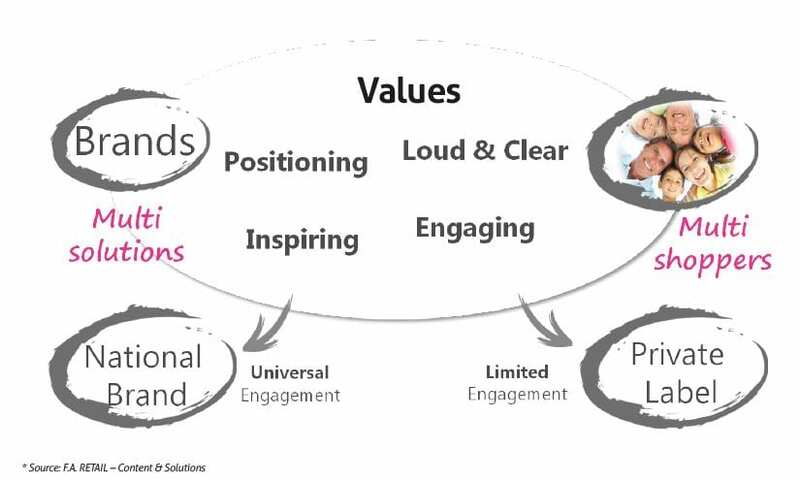 To improve the shopper experience and deliver value, I classified four important steps that can be followed by brands to achieve better satisfaction levels. The first of them is positioning, which encourages brands to define the main attributes of each sub-category and focus on them, being consistent and encouraging the complementary usage when the SKUs can be combined. The toilet paper Neve, a Kimberly-Clark brand in Brazil, created a fantastic campaign to show how humid wipes can complement the usage of toilet paper. Choosing a loud and clear way to communicate these main attributes also facilitates the purchase process: use of colour code on the packaging makes the product as visible as possible, and starting to move the communication from puppies to people – closer to our reality. Be inspiring to your shoppers and educate them on having a better use of your product, on not wasting and on being more conscious with their consumption. You can be more sustainable and show your compromise with a real cause associated with your segment. Work as hard as you can to make the process engaging by offering trials and by actually thinking with an omnichannel perspective – establishing a dialogue online and offline and being digitally focused, once this is the already present future. Quilted Northern did that in the USA, launching a great campaign with Amazon to offer to digital shoppers 45% discount once they subscribed for an automatic product delivery. 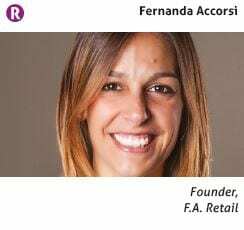 Share the post "Multi-solutions for multi-shoppers"